The Health and Safety (Safety Signs and Signals) Regulations 1996 covers the provision of fire safety signs that are required in the workplace. These Regulations bring into force the EC Safety Signs Directive 92/58/EEC on the provision and use of safety signs at work. The safety Signs Directive which was adopted by all European Union member states on 24 June 1992, which recognised the need for all workplaces to have easily recognisable signs and symbols relating to safety matters and encourage the standardisation of safety signs throughout the member states of the European Union so that safety signs, wherever they are seen, have the same meaning. In this country, the Directive has been implemented through the Health and Safety (Safety Signs and Signals Regulations) 1996. These regulations apply to all places of work covered by the Health and Safety at work etc Act 1974. All safety signs have been required to comply with these Regulations from 1st April 1996. The Regulations cover various means of communicating health and safety information. These include the use of illuminated signs, hand and acoustic signals, e.g. fire alarms, spoken communication and the marking of pipework containing dangerous substances. These are in addition to traditional signboards such as prohibition and warning signs. Fire safety warning signs, fire exit signs and fire-fighting equipment are also covered. They require employers to provide specific safety signs whenever there is a risk that has not been avoided or controlled by other means, e.g. engineering controls and safe systems of work. Where a safety sign would not help to reduce that risk, or where the risk is not significant, there is no need to provide a sign. The regulations, where necessary, require the use of road traffic signs within workplaces to regulate road traffic and also require employers to maintain the safety signs which are provided by them. Explain unfamiliar signs to their employees and tell them what they need to do when they see a safety sign. The Regulations apply to all places and activities where people are employed, but exclude signs and labels used in connection with the supply of substances, products and equipment or the transport of dangerous goods. For most firms already using safety signs to warn and instruct employees of risks to their health and safety these Regulations are unlikely to impose any significant changes, because the signboards specified in the Regulations are already covered by the existing British Standard 5499, most of these are already widely used. Existing legislation already requires suitable illuminated signs and acoustic signals to be used where necessary. There will be few other cases where these are needed, fire warning systems being one example, dangerous locations, e.g. where people may slip, fall from heights, or where there is low headroom and traffic routes may need to be marked to meet the regulations. The new Regulations specify the type of marking to be used, which again is consistent with BS 5499. Although these Regulations require stores and areas containing significant quantities of dangerous substances to be identified by the appropriate warning sign they will mainly impact upon smaller stores. This is because the majority of sites where 25 tonnes or more of dangerous substances are stored can be expected to be marked in accordance with the Dangerous Substances (Notification and Marking of Sites) Regulations 1990. These have similar marking requirements for storage of most dangerous substances. Stores need not be marked if they hold very small quantities, and the labels on the containers can be seen clearly from outside the store. Safety signs are divided into categories according to the type of message they are intended to convey. Each category is assigned a specific format and set of colour s. Detailed specifications such as relative dimensions and the permitted relative proportions of colours are given in BS 5499. 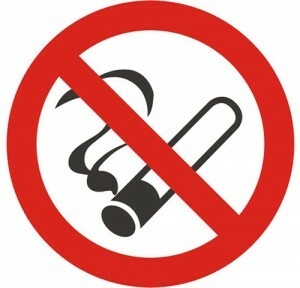 These signs should he used to convey “Do Not” type commands For example, to indicate that smoking is not allowed or where a particular material reacts dangerously with water, “Water should not be used” sign. In the workplace they should be used to reinforce instructions prohibiting dangerous activities and are required by the Health and Safety (Safety Signs and Signals) Regulations 1996. Such instructions, however, should also form part of the employees training. Signs prohibiting an activity consist of a circular red band and single diagonal cross bar descending from left to right at an angle of 45 degrees. The background should be white with the pictogram indicating the nature of the command in black. These signs should be used to make people aware of a nearby danger. For example, a flammable liquid store or a laboratory where radioactive substances are in use should have an appropriate warning sign near the entrance. These signs are required by the Health and Safety (Safety Signs and Signals) Regulations 1996 and in specific cases by the Dangerous Substances (Notification and Marking of Sites) Regulations 1990. Signs warning of a particular hazard consist of a black band in the shape of an equilateral triangle. The background within the band should be yellow with the pictogram indicating the type of hazard in black positioned centrally on the sign. These signs should he used to indicate actions that must be carried out in order to comply with statutory requirements. 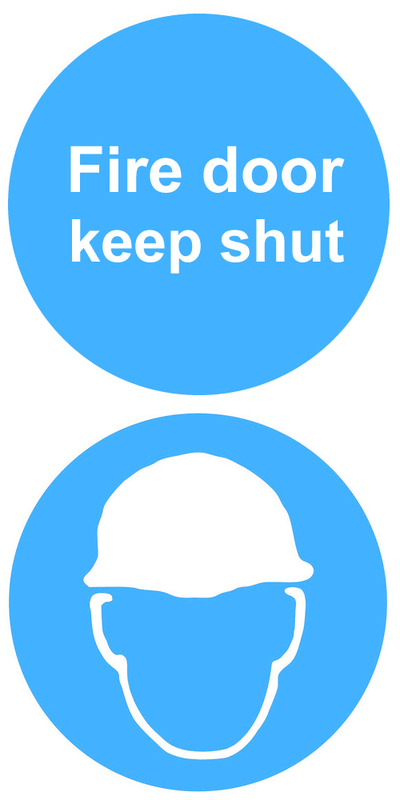 For example an area of a construction site where hard hats should be worn should have appropriate signs at the entry points and self-closing fire doors that must be kept closed, to comply with a fire risk assessment, should be labeled with “FIRE DOOR KEEP SHUT” signs. It should he noted that the Health and Safety (Safety Signs and Signals) Regulations 1996 do not apply to mandatory fire instructions but do apply to health and safety mandatory signs where pictograms are required. The minimum requirement is for the sign to include an appropriate pictogram and there are no pictograms for fire safety instruction signs. 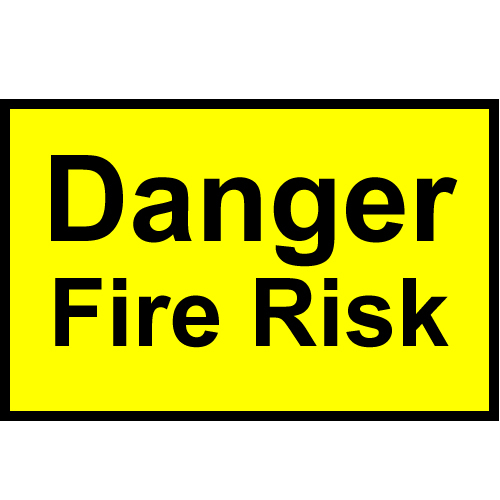 Although mandatory in the UK through inclusion in the requirements of most fire fire risk assessments, such signs are not considered as health and safety signs within these Regulations. Thus the familiar white on blue fire safety mandatory signs using text only will remain in place and will not have to be changed. Fire action notices, that is notices which list actions that occupants must carry out in the event of a fire are, by convention, written as white text on a blue background but not in the circular format. The colours are used to convey the mandatory nature of the instructions but because of the amount of text normally needed a rectangular format is used. The general mandatory sign of a white exclamation mark on a blue circle may be used in conjunction with a fire instructions notice. Signs indicating mandatory requirements consist of a blue circle with the pictogram or text in white positioned centrally. These signs should be used to indicate escape routes, emergency exits, first aid equipment, emergency showers and the like. In the same way as for mandatory signs some UK fire safety signs in this category are not required by the Health and Safety (Safety Signs and Signals) Regulations 1996. For example “PUSH BAR TO OPEN” is not required to comply and there is no pictogram with that meaning. Such signs are still needed for compliance with fire risk assessment and in some cases the Health and Safety At Work Act 1974. Safe condition signs consist of a green rectangle or square with the pictogram or text in white positioned centrally. 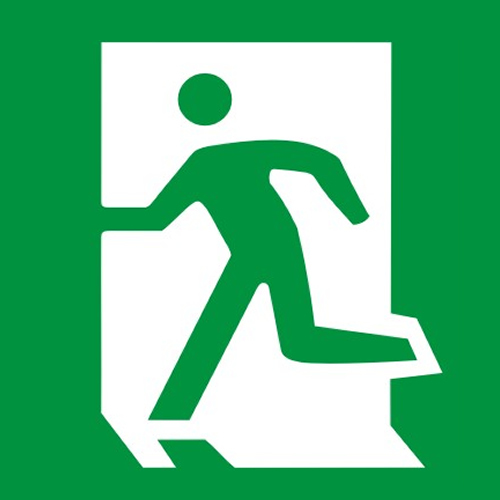 In order to comply with the requirements of the Building Regulations 1991, every doorway or other exit providing access to a means of escape, other than exits in ordinary use, should be provided with an exit sign. Installation of signs conforming to British Standard 5499 will satisfy both the Building Regulations 1991 and the Health and Safety (Safety Signs and Signals Regulations) 1996. In general these Regulations will not require any changes where existing fire safety signs containing symbols that comply with BS 5499. This is because the signs in BS 5499, although different in detail to those specified in the Regulations, follow the same basic pattern and are therefore considered to comply with the Regulations. A typical sign in these regulations. Often referred to as the ‘Euro-Sign’. A typical sign in BS5499: These signs usually contain words such as ‘Fire Exit’ as well. As the result of this flexibility there are at least two exit signs available in the UK and there could be more throughout the EC. Because of this the EC directive 92/58 has failed in its principle aim to have common standard throughout the member states. However a new European standard has been proposed and ISO 7010 is very likely to be fast tracked to become Pr EN 7010. This means that it will be a “European Normative” and will be best practice guidance. As a result EU law will required it to be adopted by all member states without change. Consequently the Health and Safety (Safety Signs and Signals) Regulations 1996 will be amended and the above Euro-Signs will be illegal. Pr EN 7010 will become the required standard and incidentally the exit sign will be identical to BS 5499: Part 4: Code of Practice for Escape Route Signing. The regulations place a duty on employers to ensure that safety signs are provided in circumstances where the risk to the health and safety of employees, identified through the risk assessment requirement contained with the Management of Health and Safety at Work Regulations 1992 cannot be entirely, engineered or managed out of the workplace. It should be noted that the Regulations do not require safety signs to be used where there are no significant risks to the health and safety of employees. The issue which then requires to be resolved is whether it is necessary to indicate exits with signs. In arriving at a decision the fundamental issue which will underpin the process is whether the risk of injury or death to employees from a fire within a particular premises is deemed to be significant enough to warrant the provision of signs indicating fire exit routes and final exits. If it is deemed that the risk is not significant then there is no need to install the signs. 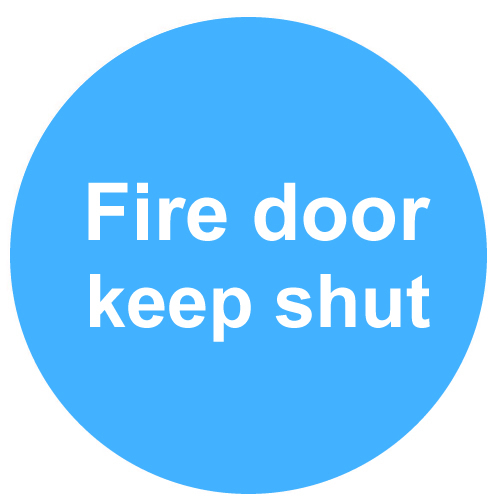 Thus, for example, a small, single storey premises with one clearly visible exit should not require a fire exit sign because it would be obvious to staff that the door is their only means of access/egress and hence there should not be a significant risk to their health and safety from fire by not signing the door as an exit. However, those buildings with more complex internal layouts incorporating multiple exits, some of which may not be readily visible nor frequently used, or where large numbers of the public congregate, will require fire exit signs, complete with directional arrows where necessary, if there is a significant risk of individuals not being able to find their way to a place of safety in the event of a fire. More information can be found on Fire Exit signs. These are signs used to provide additional information. In the Health and Safety (Safety Signs and Signals) Regulations 1996 these are confined to directional arrows. However BS 5499 includes various text messages as well as arrows under the description of supplementary signs. To comply with the Regulations where a direction indication is needed the minimum requirement is for a supplementary sign in the form of an arrow. The supplementary text messages in the British Standard such as “Water as an extinguishing agent prohibited” will be acceptable under the regulations only if accompanied by an appropriate pictogram. This is entirely consistent with the philosophy of the British Standard.Supplementary signs consist of a square or rectangle in the appropriate colour with the pictogram or text in white and positioned centrally. The colour should be green where the information supplements a safe condition sign, red where It supplements a fire equipment sign or yellow to supplement a warning sign. There is a minor conflict between the British Standard and the regulations on the permitted colour of supplementary signs. BS5499 allows text to be in black on a white background or white on the appropriate colour. The colour alternative is the only option permitted in the Regulations. Thus the Regulations can be complied with by adhering to this option in the Standard. Exit signs should be legible at all material times. In premises where emergency lighting has been considered necessary for means of escape purposes such signs should be illuminated by the emergency lighting supply in the event of a failure of the normal lighting. Any of the following methods are considered suitable, lamps external to the sign but providing adequate illumination of it, lamps contained within the sign, internally illuminated signs, Self luminous signs requiring no external power source. Reference should be made to the following British Standards where appropriate. B.S. 5499 Safety signs, including fire safety signs. The visible areas of these signs are manufactured from Photoluminescent materials. These materials contain chemicals that are able in absorb and store energy from daylight or artificial lighting. When the source of energy is removed the chemicals are able to release the energy in the form of light. Several companies produce Photoluminescent signs with pictograms complying with these regulations although the colour’s may not exactly match the specifications within the regulations. The properties of these signs make them useful to supplement normal signs in some situations. For example, they perform well as signs under the reduced light levels provided by emergency escape lighting operating on failure of the normal supply. There is no objection to the use of this material to supplement emergency lighting, but it is not acceptable to use it as an alternative to emergency lighting. This type of material is often used in strips at low level to highlight the contours of escape routes. The same material also finds a use in wayfinding systems. Photoluminescent systems should be installed in compliance with the Code of Practice for the installation in Premises of Emergency Way-finding Guidance Systems, produced from Photoluminescent Materials, Safety Signs and Markers. This Code is published by the Photoluminescent Safety Products Association. These signs are used to mark the location of fire fighting equipment and fire alarm activation points. However, where possible, fire equipment should be positioned where it is clearly visible. The Health and Safety (Safety Signs and Signals) Regulations 1996, require red to be used as the identifying colour for fire fighting equipment. If the equipment itself is red this will satisfy the requirement. Where it is not red then highlighting the position of fire fighting equipment by colouring background behind the equipment red may be enough to comply. 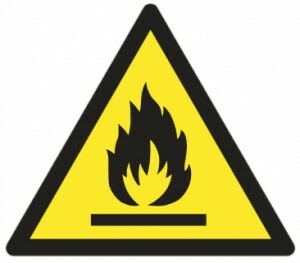 Fire equipment signs consist of a red rectangle or square with the pictogram in white positioned centrally on the sign. The same general process outlined above is applicable to this section. Again it is assumed that because there is a possibility of a fire occurring in the premises then fire fighting equipment will be needed. Whether this equipment also requires to be identified by means of a sign will depend on the physical environment in which the fire risk assessment takes place. In other words the features of the workplace, the activities carried on there and any other circumstances deemed to be pertinent must be taken into account. For example, in a building where the internal layout is such that the extinguishers provided are clearly visible to employees there should not be a requirement to further indicate the position of the fire fighting equipment with a sign, or by colouring the background red. Alternatively, in more complex building layouts, for example where it is not always possible to ensure that fire extinguishers are in the line of sight of employees, for example due to the nature of the work process or where hose reels are installed within cabinets or where fire fighting equipment is contained within recessed fire points then it would be pertinent to provide signs indicating the position of the equipment complete with directional arrows where applicable. It is important to highlight that the process by which a decision is reached regarding the necessity or otherwise of providing fire fighting equipment signs should be based on whether a significant risk exists as a consequence of the particular location of such equipment. If it is deemed that a significant risk does not exist then there is no requirement to provide the signs. Where evacuation from buildings is needed, the Regulations require the fire alarm signal to be continuous. Fire alarms conforming to BS 5839-1:2017. Fire detection and alarm systems for buildings do not need changing, nor do other acceptable means such as manually operated sounders, e.g. rotary gongs or hand bells. If, following the risk assessment, it is deemed necessary to provide any fire safety signs then they should comply with the Regulations which details the colour, maintenance regime and general advice associated with the provision and use of safety signs in general. It is also deemed acceptable to use fire safety signs which comply with B85499 Current Edition in lieu of signs specified or not detailed in the Regulations. Consequently, where BS5499 signs are already in place it will not be necessary to remove them. Additionally, it will also be acceptable for employers to continue to purchase such signs for use. Fire safety signs deemed not to be acceptable are those which contain text only information therefore such signs should no longer be used. However in the case of existing premises where such text only signs are already in place and the risk assessment determines they are necessary, employers will have to replace them or supplement them with the appropriate pictograms. 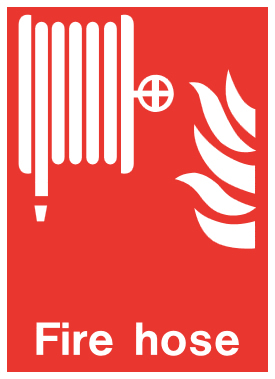 An excellent reference handbook for fire safety signs is produced by the Fire Protection Association. This page contains notes on good practice which may not compulsory but which you may find helpful in considering what you need to do.